I wrote earlier today about Chapter 2 in the Book Whisperer. While I'm more than willing to challenge my kids, I'm not sure about a 40 book goal. Especially when dealing with 3rd graders - many of whom are ESL students and/or SWD. 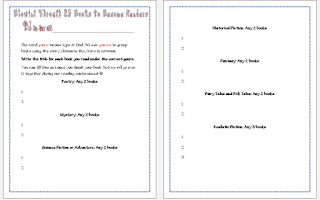 I spent most of my morning working on a 25 book challenge. I thought about the genres we discuss and the books available in our classroom library. I'm more than willing to let the children use school and city library books for this as well, I just based it off what I had in the classroom.